Any night owls curious as to the nature of tonight’s Two Boots affair must wait a few hours. However, what will be germane to at least part of the post is the New York Mets career of Rich Sauveur. Look over his statistics here. It won’t take you long. The other of my two roommates returned from extended travels last night, and in deference to his Red Sox fandom, the house flipped between the end of the Boston game against the Detroit Tigers, and the Mets game against the Does-It-Really-Matter?. We talked about what football team I should root for this coming season. If I’m not mistaken, I may have mentioned on this blog that I’m a man without a team, finding it impossible to root for the Jets for the pain it would cause; being banned from rooting for a number of other teams because of friends’ Jets-framed ire. No Giants, no Cowboys, no Patriots, no Steelers. I mentioned the Kansas City Chiefs. I bear no animus towards the Chiefs; I think, despite the Herm Edwards business–or perhaps because of it–the Jetstock hold no grudges, either. For those who don’t know, Brent Mayne was a catcher for the Mets back in 1996. I barely remember him on the Mets because while Todd Hundley had a bit over six hundred plate appearances, Mayne had barely over 100. He struck out almost as many times as he hit safely. He did have a home run that year, which is more than I can say for some Metsies hanging about right now. But he was quite a citizen for the Royals, and Wikipedia rides the rail (but is technically correct) with his trivia claim to fame, being the only MLB catcher in the 20th century to have won a game as a pitcher. He had only 131 days left to do it. Hell, from the most highly technical perspective, he only had 39 days left in that season to do it. The year 2000 was in the 20th century. Pennies are money. The bus fumes are free. Et cetera. Fourth all-time in fielding percentage is a gaudy stat, as well. He has a great blog to boot: see it here. Spent most of the night reading through it. HIGHLY recommended. So, yeah, Brent Mayne. My roommate’s story checks out. Who the hell knew? I have to think he’d’ve done better than Omir Santos last night. Or had the presence of mind to argue against walking Augie Ojeda in the bottom of the second. Miguel Montero on second with two out and the score freshly 1-0. In the bottom. Of the SECOND. Look, if the Mets are at the stage of baseball in 2009 where they can’t trust their onetime second act to Johan Santana to get Augie Ojeda to fly out, ground out, or otherwise show his human frailty, and save the pitcher’s spot for the bottom of the third, then I just don’t know what in the hell to do. And don’t give me playing the percentages. Mike Pelfrey should, at this stage in his career, know how to get right and left and switch-hitters out, even in pressure situations. And I’ll remind you again: it was the BOTTOM of the SECOND. Yikes. I don’t like getting this heated about something like this, but since the overmanaging of the game against the Cardinals on the 4th, I’ve worried about coming back to baseball and seeing only the heavy hand of Jerry Manuel. I don’t like disliking the manager. But now I do. What’s the score if you take away Doug Davis’s hit in the bottom of the second and replace the dessicated remains of Elmer Dessens for a competent relief pitcher in the seventh? It’s a fallacy; a weather balloon could’ve crashed in the outfield and suspended the game. But if I’m truly one of the last few with hope for the season, and the name of the game is seeing what they guys have got, then why not let Pelfrey pitch his way out of trouble, and send Elmer Dessens (a known and unhelpful quantity) back where he came from? I won’t accuse Mr. Manuel of giving away the game. At this point, I’m accusing him of doing a poor job with admittedly limited options at best, and at worst betraying an inside directive to see what parts of this team can do for 2010. *Soon you’ll see a few new I-Can’t-Do-Without links on the sidebar. I’ve come to Jesus and Baseball-Reference, as well as the MLB-based stats pages. Thanks, CBS; it’s been real. **Be well and rest easy, Mrs. Mantle, who passed away yesterday. A true example of how strong men are backed up by stronger women. someone’s duty. Fix. This. Now. Yes, absolutely. Fix it. Who’ll accept a trade to the Mets (and we need the kind of players that can fetch no-trade clauses) with the mess this place looks like? ::strangled, irritated, impotent groaning. :: Goddamn it. If you’re coming to this blog for late-breaking updates on the Mets game, you’re coming to the wrong place. I was at Faith And Fear In Flushing’s METSTOCK event tonight at Two Boots Pizza on Grand Street this evening. Watched the Mets game with them, and Mets By The Numbers, And Pick Me Up Some Mets, and Dana Brand. I have photos. Tomorrow, tomorrow. Frankie Rodriguez couldn’t get his first pitch in place for a strike. They’d dip low and then he’d be behind in the count. 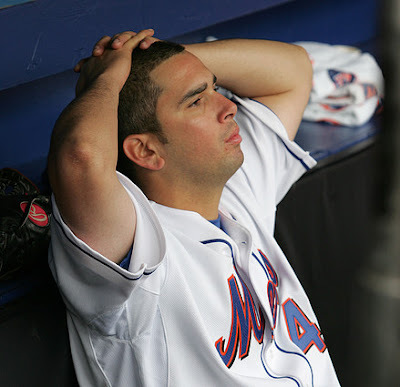 Regardless of how much the Mets SHOULD have scored, this loss is on him. Everybody gets one. More tomorrow. Sleep now. Huzzah.